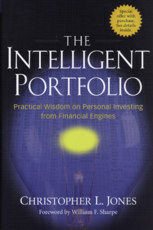 Written with the thoughtful investor in mind, The Intelligent Portfolio draws upon the extensive insights of Jones and Financial Engines -- a leading provider of investment advisory and management services founded by Nobel Prize-winning economist William F. Sharpe -- to reveal the time-tested institutional investing techniques that individuals can use to help improve their investment performance. Throughout these pages, Financial Engines' Chief Investment Officer, Christopher Jones, uses state-of-the-art simulation and optimization methods to demonstrate the often-surprising results of applying modern financial economics to personal investment decisions. By illustrating the realistic range of possible investment outcomes, Jones skillfully reveals how the decisions you make today can impact your financial future. Challenging conventional wisdom that often leads both novice and experienced investors astray, The Intelligent Portfolio builds from basic intuition on how financial markets function to practical tips on evaluating investment trade-offs and real-world advice on selecting investments to better reach your goals. In addition to the information outlined throughout this book, you'll also receive a fee waiver for a one-year investment advisory account at Financial Engines.com, so that you may apply what you've learned here to your own investment endeavors. Through simple explanations of powerful investment ideas and real-world examples that bring them to life, The Intelligent Portfolio reveals what you need to know when making personal investment decisions. With this book as your guide, you'll quickly discover how you can effectively implement the strategies that institutional investors have known for decades -- helping you achieve a brighter financial future.